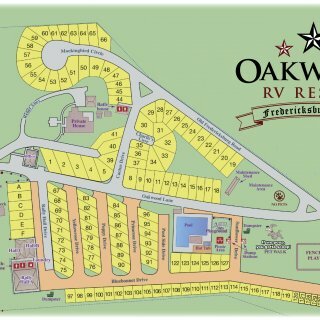 Ask fellow campers about "Oakwood RV Resort" and nearby attractions. We stayed here for a month. The restrooms/showers are clean and adequate and cleaned daily. Laundry is $1.25 a load. We paid for a 'premium' pull through site which gets you a fire pit and free wood. Unfortunately, these sites are piled right at the entrance/exit to the campground. They are gravel. The 'locals' who live/work here spend all day running their diesel trucks in and out of the park, using the empty premium sites as shortcuts if possible. We made 3 trips to the 'hot' tub, and it was barely 90 degrees each time. Complaints to the manager went nowhere. Road noise and inconsiderate dog owners are prevalent. Would not recommend, nuff said. We camped at Oakwood RV Resort in a Fifth Wheel. Very disappointed in this park. We drove further to camp here because of the web page and reviews. We went in and said we had Passport and in my opinion were treated like 2nd class. We were also told if we stayed an additional night (and we HAD planned to) that we couldn't use ANY of our other discounts. Passport afforded us a back-in site only according to the check in person. We had FHUs but the Wi-Fi shouldn't be advertised since it apparently doesn't work (tried off and on for hours). The site was so narrow after leveling we couldn't open one slide without totally hooking back up and re-parking. The rain left the park in puddles and it obviously needs some additional gravel to extend the very short sites and repair the roads. If we had paid the full price we would really be upset. We would pay extra and stay elsewhere. The dead end roads made leaving more complicated and we drove through a vacant site to reach the exit street. Park could be laid out more efficiently and fixed up to be nice. We camped at Oakwood RV Resort in a Fifth Wheel. Others mentioned close sites, but these were the closest I have ever seen. I literally had to move my neighbor's picnic table out of the way for my living room slide slide to go out over their patio. I was in a pull through space, but had to back out to leave because of tree limbs blocking my exit. When we checked in, we were advised that our site was too far away from the office to expect Internet service, and I appreciated that. What They didn't tell me the park was having water issues, and we had almost no water pressure on Friday. Then, Saturday morning, the water quit working completely. Fortunately I keep some water in our RV. We love the area, but will seek an alternative place to stay next time. We camped at Oakwood RV Resort in a Fifth Wheel. I think this park has seen better days. The Wi-Fi does not work at all. They told us that when we checked in. We weren't too happy to hear it, but they didn't seem to care about it. The sites are narrow but usable. The pool is really nice, although it was closed, due to the time of year. The hot tub is an old one, not built in, but like one you might have in your back yard. It had duct tape in some places. I tried to do laundry, but only two of the four washers worked, one had dirty clothes in it and the other was in use. Only one dryer DIDN'T have an "out of order" sign. Since the room smelled bad anyway, I gave up and left. Our AT&T cellphones worked fine. For this price we will go elsewhere next time. We camped at Oakwood RV Resort in a Fifth Wheel. First, this Park should be re-named DogWood! There is a huge pet run for those that have pets and the pet owners do nothing to contain their animals to that area. Yes, there are rules and rules but the Park Management does nothing about these "rule breaker actions." For example: there is a 2 dog rule per RV. On numerous occasions the door to an RV would open and out come four dogs! Many horse trailers (with RV sleeping quarters) one such trailer had four border collies (unleashed) running all over the Park. There was a range (feed) truck running all over the park at times. Some of the guests would have to use the dump station at the termination of their stay because the full hook-ups they had at their site consisted of a PVC sewer pipe that was higher than the pipe on their RV! Stay away from Dog Wood. They have many rules but NO ONE enforces anything! Our daily rate reflected a monthly stay. We won't be back! We camped at Oakwood RV Resort in a Motorhome. Pull-through sites are so tight our tires rubbed on elevated concrete pads when trying to get into our site with a big rig. Staff was not friendly, in fact rude and the office was unprofessional with some offensive signs on the walls. Would not stay or recommend to anyone. We camped at Oakwood RV Resort in a Motorhome. Interior roads become muddy with large amounts of rain which we had. Older park with very close difficult sites to navigate. Slides will hang over neighbors patio. We camped at Oakwood RV Resort in a Fifth Wheel. Attitude of the staff was very poor and surly. They quoted one price and then wanted to raise the price if we extended our stay. When the weather turned freezing, they would not extend us because they were booked up, nor would they give a refund so we could get out of there before the freezing rain hit. We camped at Oakwood RV Resort in a Fifth Wheel. Pacific War Museum is a must for history buffs. Alstedd Brewry worth checking out for good, reasonable priced German beer in pretentious surroundings. Backwoods BBQ just down the road also worth a visit. Make sure the spot you get is close to a wifi antenna but easy to back into! Would recommend Oakwood to any traveller. Don't fail to go across the street to Hilda's Tortillas! Very convenient to downtown and city shuttle comes thru the park. Fredericksburg is known for the many wineries that surround the community. There is a wonderful German heritage here along with interesting shopping, the Nimitz history museum and nearby state parks. An HEB grocery store, Walgreens, hospital and gas station are nearby or within one-two miles of Oakwood RV Resort. We've been coming here for years and still haven't seen it all! You must visit the Pacific War Museum. It is overwhelming! This park was close enough to downtown but far enough away to be quiet in the evening. Wildseed Farms is a must see! The National Museum of the Pacific War is a must see when visiting this area. There are a lot of wineries along hwy 290 and lots of shopping and restaurants along Main Street. Fredericksburg has a lot to offer for all ages. Don't miss Fredericksburg Trade Days and Auslander German Restaurant. Enchanted Rock State park is 19 miles north of Fredericksburg and is a great hiking location. There are 40+ wineries in the area and more being built. The National Museum of the Pacific War is a must see! 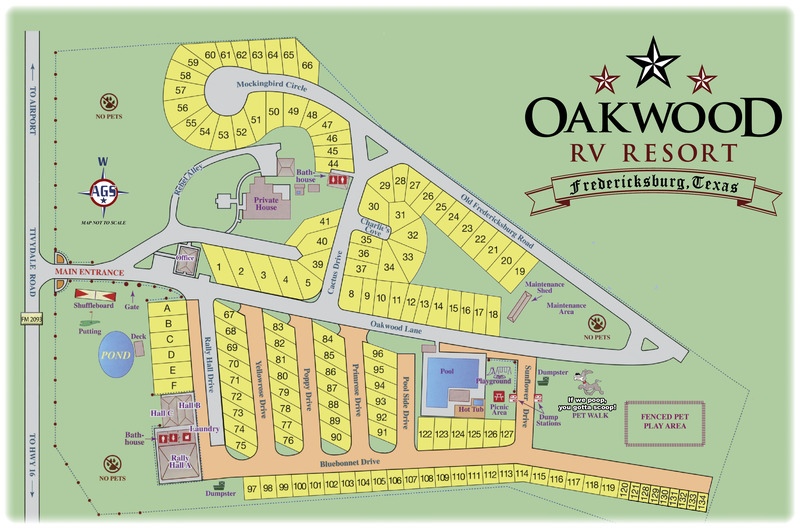 Are you affiliated with Oakwood RV Resort ?